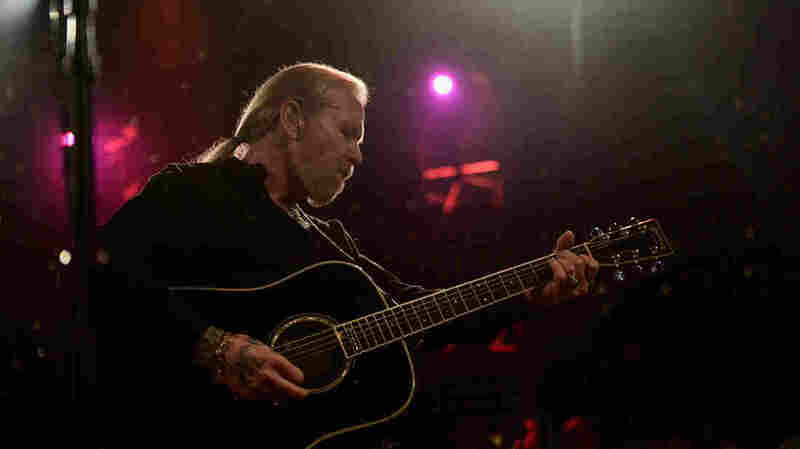 Southern Rock Legend Gregg Allman Of The Allman Brothers Band Dies At 69 One of the most recognizable voices of his generation, Allman was one of the namesakes of a band that pioneered Southern rock — yet his music was always haunted by a sense of mortality and loss. Gregg Allman performs at The Fox Theatre in January 2014, in Atlanta, Ga.
Gregg Allman had one of the most recognizable voices of his generation. And he always felt like a blues artist — one who was haunted by losses that propelled some of the most memorable music of the 1970s. Allman died Saturday due to complications of liver cancer. He was 69. Gregg Allman and his older brother, Duane, were born in Nashville, Tenn., but raised in northern Florida. They were children of the South, where a blend of country, blues and gospel could always be heard on the radio and in the air. Gregg Allman's voice reflected all of those influences. "Growing up in the South at that time, there was a proximity to a lot of different kinds of music," says Alan Light, co-author of Allman's autobiography, My Cross To Bear. "There were different influences that enabled you to draw on a spectrum of sounds and different emotions — that in other parts of the country, you just wouldn't be exposed to in the same way." Gregg Allman was just one year younger than Duane. They formed a close-knit bond after their father was murdered when Gregg was 2. As teenagers, they formed various bands that mimicked the sound of the British Invasion. But when Duane Allman left behind a lucrative gig as a session musician in Muscle Shoals, Ala., he called his younger brother to join a band with two lead guitarists and two drummers. That's how a collection of friends and former bandmates coalesced into The Allman Brothers Band, which released its first album in 1969. The Allman Brothers Band performs "Midnight Rider" in 1991. "[Gregg] was always so careful ... to say that the vision for the music for The Allman Brothers came from his brother," Light says. "Duane had an idea for the band. He could see something Gregg couldn't see. It took sitting down in the room and seeing the caliber of those players, and the chemistry between them, for him to see what Duane was talking about." The induction of the Allman Brothers Band into the Rock and Roll Hall of Fame in 1995 was based largely on the music the band had made on its first four albums. That music has been labeled "Southern rock" thanks to the band's home base in Macon, Ga. — but it was much more than rock, and it reflected a lot more than the South. The Allmans embarked on lengthy musical explorations that reflected the discipline and dynamics of classical music, the passion of soul and the improvisational spirit of jazz. Gregg Allman's contributions were his singing, his chops on the Hammond organ and his songwriting. As a composer, he wrote songs that not only were FM radio hits back in the '70s but eventually became popular with an entirely new generation of Allman Brothers fans. The Allman Brothers Band performs "Whipping Post" in 2014 for All My Friends: Celebrating The Songs And Voice of Gregg Allman. The Allman Brothers Band's offstage history was a bit of a rock and roll soap opera. Shortly after the release of that first album, the band experienced the deaths of both Duane Allman and bassist Berry Oakley within a year of one another. There was significant substance and alcohol abuse among band members, the pressure of constant touring, strained relationships, illnesses, breakups, reunions. As the title track of his 1987 album suggests, Allman was admittedly no angel. But Alan Light says a sense of mortality and loss haunted his life and fueled his most powerful songwriting. "In his house, there were framed notes from Duane hung on his walls," Light says. "He surrounded himself with reminders of his family and that loss. And yet, to get up every night and play in The Allman Brothers Band when you're the Allman brother who is still there — and the other Allman brother isn't — is a perpetual reminder of that loss." While Gregg Allman's death closes a chapter on rock and roll history, perhaps it also means that the Allman brothers are once again making music together.